Slate roofing has been around for a long time, with good reason. It’s an utterly reliable building material, easy to work and very tough. 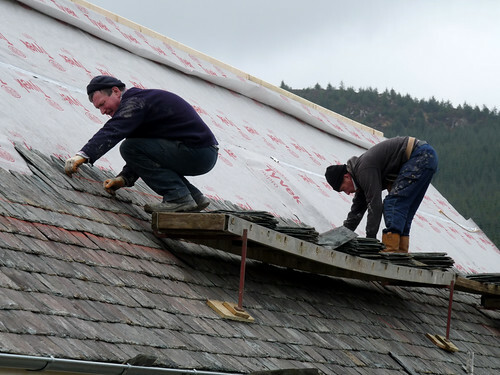 As roofing, it’s famous for its durability. Slate roofs have been known to outlast houses. This is the no-fuss option for people who want good design and great looking roofing. Slate roofs are in a class of their own. These are truly durable, reliable materials, preferred by builders, architects and designers alike. The top of the range in roofing slate is Welsh Penrhyn, a type of slate which has been continuously mined for over 300 years. Its current recorded product life is 200 years. Modern Canadian and Spanish slates are certified to last 75 years. Only stone can last this long. Conventional roofing tiles are basically similar to bricks or ceramics. They don’t have the same density as slate, and can’t match the other characteristics. For designers, slate is quite simply a much better choice. The slate roof is a true stone, and has a much higher aesthetic value. Slate is also extremely easy to work, and can be used for demanding jobs in complex roofing designs. 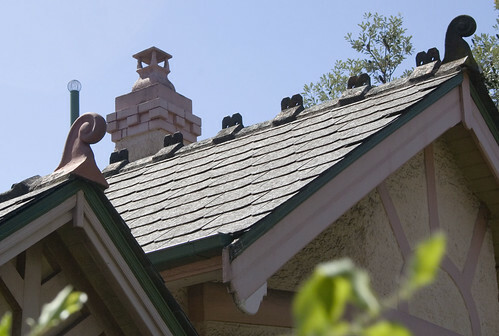 Slate roofing has a history of being used for everything from cottage roofs to cathedrals. That’s a good indication of the versatility and adaptability of slate for any roofing task. Slate roofing rarely if ever needs replacement, and is actually considered a value adding material in terms of house value. There’s a reason for that. Conventional roofing can be quite expensive, and replacement adds more expense over time. The slate roof does represent real dollar value to the home owner. There are many roofing suppliers who won’t stock anything but slate, notably in the US, where it’s a highly regarded type of roofing, able to survive blizzards and heat waves. Define the roof area from your plans. This is a square metre area, which is accurate enough for a reliable quote. Check out the types of slate roofing available, starting with the best quality slate, like the Welsh Penrhyn, to get an idea of price ranges. Decide what sort of colour scheme you want. Slate has subtle variations in colour depending on composition, from a pale grey to a blue grey. Get a quote from a local supplier, and ask for advice if you have any questions about installation, warranty, or building issues. This quote is like a map of everything you need to know about your roofing slate. Good suppliers can give you all the information you require to make an informed decision.